This past January, during Catholic Schools week I was asked to visit the kids at Sacred Heart Catholic School in Miles City. I was promised an enjoyable afternoon if I took a little time to talk about vocations before lunch. After saying Mass in Jordan I jumped into my pickup, carrying my normal winter gear, and headed down the road. The enjoyable afternoon was to spend the time with the kids at the skating/sledding area in Miles City. It was a good thing I had my winter gear in the pickup because the cowboy boots would not have worked very well on the ice. The newer toboggans did OK that afternoon, but I was able to find an old fashioned sled with metal runners. 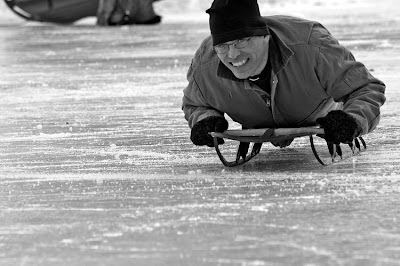 Taking off down the hill to get a little bit of speed allowed me to make it all the way across the frozen pond. The kids quickly learned that there is a difference between taking a toboggan on snow, and a sled on ice :) As you can see by the picture, I was enjoying the afternoon. And being a kid again isn't a bad way to spend the day. LOL! As Mr. Chesterton said, "Angels can fly because they can take themselves lightly." Especially on a good sled, on ice!